When I saw this book in the bookstore, I wasn't actually planning to buy it. I really wanted to read it - yes - but I was just planning to buy it as a kindle edition and be on with my life, but once I saw this cover in real life? I just had to have it! Haha, who else has this problem? I love Alice in Wonderland - who doesn't? The problem is that I've never read an actual retelling of the story. 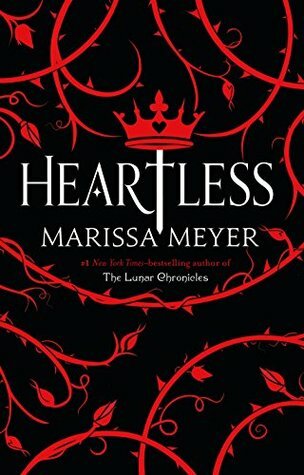 Heartless is my first and I absolutely adored it! It's always interesting to read about the backstory of the evil villain to see how they got where they are. I'll try not to give too much away! Cath starts off the story as the sweetest person: sassy, kind and passionate. She is the type of person to ignore social status and class to befriend who she wants. Her friendship with Mary Ann was something I found weak, as in it didn't seem like they were actual friends, unlike Cinder and Iko's friendship. How would she go from this to the cruel, ruthless Queen of Hearts? I found myself asking this question nearly every chapter, because I was nearing the end of the book and it still hadn't happened yet.